The purpose of this paper is to organize and summarize existing information on delayed medical attention for women with breast cancer and identify research needs in this area. This review is organized in six parts: origins and permanence of the message "do not delay" medical attention for potential cancer symptoms; definition and classification of breast cancer delay; impact of delay on breast cancer prognosis; factors related to breast cancer delay and the ways these have been studied; the study of breast cancer delay in Mexico; and directions for future research in developing countries, with a special focus on Mexico. We point out the need of a more integral study of delay that takes into account socio-structural and health services factors, in order to find modifiable factors towards which political actions should be directed to improve breast cancer medical attention in underdeveloped countries. El objetivo de esta revisión es integrar información disponible con respecto al retraso en la atención médica del cáncer de mama e identificar necesidades de investigación en este tema. La revisión consta de seis apartados: origen del mensaje "no retrasar" ante la aparición de síntomas de cáncer; definición y clasificación del retraso en la atención del cáncer de mama; impacto del retraso sobre el pronóstico de la enfermedad; factores asociados con el retraso; la investigación del retraso en la atención del cáncer de mama en México; y necesidades de investigación en este tema. Se señala la necesidad de estudiar el retraso en la atención del cáncer de mama de forma más integral, tomando en cuenta características socio-estructurales y de servicios de salud, para identificar factores modificables hacia los cuales dirigir esfuerzos para mejorar la atención de esta enfermedad en países en vías de desarrollo. The majority of breast cancer deaths occur in developing countries.1 Mortality reductions achieved in the last decades in developed countries have not been achieved in developing countries mainly because of a lack of access to early medical attention.2 Most cancer in low- and middle-income countries (LMC) are detected at later stages than in high-income countries.3 It is commonly assumed that this late diagnosis is due to the population's lack of information and to deficient coverage of screening programs. However, there are very few research studies on the reasons behind delayed medical attention for breast cancer in women in underdeveloped countries. The purpose of this review is to organize, summarize and critically assess existing information on delayed medical attention for women with breast cancer and identify research needs in this area for LMC. Information from 96 studies is summarized in this review. Selected studies were analyzed in order to respond to specific objectives. Results are presented in six parts, each of which corresponds to one of these objectives: I) understand the origins of the message "do not delay when you discover breast cancer signs or symptoms"; II) review the different definitions and classifications of delay used; III) analyze what is known to date regarding the impact of delay on prognosis; IV)identify factors related to delay and the most relevant methodological features of studies analyzing them; V) critically analyze available information on delay in Mexico; and thus VI) identify research needs on this topic in LMC, with a special focus in Mexico. Origin and permanence of the message "do not delay"
Since the creation of the "radical mastectomy" surgical technique developed by William Halsted in the late 19th century, a widespread belief originated among surgeons about surgery being able to "cure" patients if done "in time".9 Halsted himself wrote: "a cure for breast cancer is not only possible, but, if operated upon early, quite probable. "10 For over 70 years, research has thrown results in both directions, supporting and rejecting an association between delay and survival. Despite the controversy, the prevailing message among doctors, researchers and lay people since the beginning of the 20th century has been do not delay medical attention when dis covering cancer symptoms. Nevertheless, this controversy could have contributed to hinder recognition of the importance of research on factors that could explain delay. Before we further discuss this issue, we will review the most accepted definition and classification of delay. Total delay in cancer is defined as more than three months between symptom discovery by the patient and the beginning of medical treatment. Longer delays are associated with reduced survival.8 Studies done in different countries have estimated total breast cancer delay to range from 17%11 in a population sample of the Saarland region in Germany to up to 42.5%12 in a regional hospital sample in Tehran, Iran. Total delay is usually divided into patient delay and provider delay. The first study on cancer delay where these two types of delay are described was done by Pack and Gallo in 1938. They defined "undue patient delay" as "three months or more elapsed time between discovery of symptoms and a visit to a physician. "13 This first definition has been surprisingly preserved for 70 years in most studies of patient delay, even though the time threshold was established arbitrarily. Provider delay refers to a prolonged period of time between the initial medical consultation and the beginning of definitive treatment. It is also known as system or doctor delay. Pack and Gallo defined one month as "adequate time for the physician to take appropriate action. "13 This too was arbitrarily established. Although other researchers have used it, variability of the period of time used to define provider delay has been greater than that of patient delay. In this section we argue that delay adversely affects survival due to disease progression. Study results regarding the relation between delay and the most important known prognostic factors are discussed. 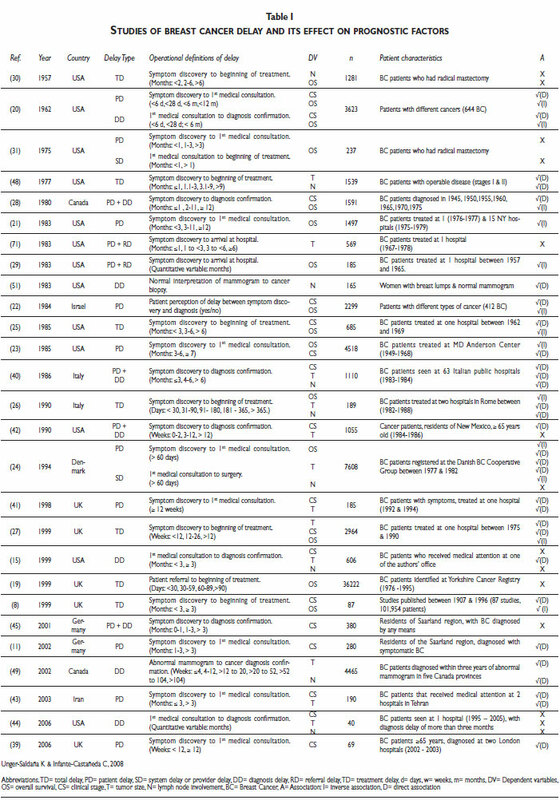 Table I summarizes general characteristics and results of these studies. This association was taken for granted during at least a century,9 but it was proved in 1999.8 Prior to this, various studies yielded contradictory findings. Differences in conclusions between studies may be due to: 1) differing sample characteristics (including patients in all clinical stages or only patients with operable cancer), 2) differences in the delay interval studied (patient, diagnostic, treatment, provider, total delay or different combinations) and 3) differences in time periods used to define delay (e.g. 1, 2, 3, 6 months, etc.). The association between provider delay and survival has been more controversial. Some authors have reported no association19,31 while others have found an inverse association between diagnosis delay and survival time.20 Furthermore, others have found a direct association which might seem paradoxical, i.e. the greater the provider delay, the longer the survival.24 This has been explained as the ability of health providers to identify more advanced cases, with a probable short time of survival, and speed up the beginning of treatment. Studies in support of this argument have found that small tumors24,32 and early clinical stage33 are associated with delay, probably because diagnosis of early disease is more challenging for physicians. These findings might be taken with skepticism by clinicians, as breast cancer can disseminate early in the course of disease.34 It has recently been shown that even cells from ductal carcinoma in situ can metastasize.35 This could make us wonder how important could a delay of three to six months in the clinical phase of the disease actually be. While for many patients, delays between three and six months would probably not have an impact on five-year survival,8 it has been well documented that as delay time increases, so does the probability of clinical progression,25 which has shown to negatively affect survival.25,36 Even though breast cancer's natural history is unpredictably heterogeneous,34,37 most studies have shown a reduction in mortality with earlier diagnosis.38 Therefore, as long as this disease can not be prevented, efforts should be kept in direction of early and adequate diagnosis and treatment. Most studies have found that the longer the delay, the more likely a woman is diagnosed in advanced stages (Table I). Studies that have considered total delay or patient delay as independent variables (using the most accepted operational definitions) have consistently confirmed this association.11,20,22,23,25-28,39-43 The meta-analysis performed by the London group8 also found 13 published studies that confirm this same result. Tumor size is one of the most important prognostic factors in breast cancer.7 After clinical stage, it is the prognostic factor that has most consistently been associated with delay.15,24,26-28,40-43,48,49 The longer the delay, the greater the tumor size at diagnosis. This is another indicator of delay's effect on disease progression. Breast cancer delay is not only associated with a reduced survival time. Given that the longer the delay, the more likely for the patient to present with large tumors and regional lymph node involvement, delay conveys a greater risk of needing more aggressive treatments. Hence, the longer the delay, the more likely it is for a woman to require mastectomy instead of conservative surgery as well as more toxic or extended adjuvant treatment.52 Patients diagnosed with advanced disease have also shown to have important psychological morbidity.53 Both these aspects strongly impact the patient's quality of life. Different factors have been pointed out in relation to patient and provider delay. In this section we discuss the most important factors studied in relation to patient delay and provider delay and the methodological features of these studies. As shown in Table II, according to the systematic review done by Ramirez et al,54 the only socio-demographic factors that seemed to be strongly associated with patient de lay up to 1999 were the patient's single marital status and advanced age. However, subsequent studies have continued to come up with contradictory results.5,7,11,12,32,43,50,55-58 There seems to be consensus regarding the influence on delay of presenting breast symptoms different from a lump18,21,39,41,57,59 and the patient's initial interpretation of her symptoms as "not serious. "11,54,57,59 Though not conclusive, other factors that seem to be of great importance are low education and ethnicity other than non-Hispanic white (in countries where the majority of the population is Caucasian).54 Several studies report a reduced survival time of Hispanic-American and African-American patients23,46,60 as well as breast cancer diagnosis at more advanced clinical stages23,46,61-63 in comparison to non-Hispanic white American patients. The association between socioeconomic status (SES) and delay has not been firmly demonstrated. Nevertheless, it can not be ruled out since the different ways this variable has been measured are not comparable between studies. SES is most likely related to delay as it is a "powerful determinant of possessing particular health enhancing resources. "64 Many of the factors that have shown to be related to delay are likely to be associated with a low SES, e.g. belonging to an ethnic minority, low education, rural residence, lack of health insurance, access barriers to care and activities that compete with medical attention. The patient's knowledge of other people with cancer has emerged in several qualitative studies as a relevant factor influencing help seeking behavior.6,59,74-76 Nevertheless, results about this association have been controversial in quantitative studies.12,41,43,54,57 Once more, the way this variable is operationalized and measured is inconsistent between studies, making it difficult to reach conclusions. Among the psychological factors that have been studied in relation to delay, fear deserves a special comment. Fear has been shown to have a curvilinear association with patient delay; it can either accelerate seeking of medical attention76-79 or it can cause delay.59,74-76,78,79 The mechanisms that determine one patient with fear to act one way or the other have still not been elucidated. In addition, different kinds of fears have been measured using different instruments, which further complicates comparisons between studies. We identified a lack of high quality quantitative studies that measure the role of certain relevant factors found in qualitative studies, such as: fatalism,66,67,80-82 denial,66,67,80,81,83 rationalization/suppression,66,67,79,80 em barrassment of being examined by a doctor,59,66,67,78 and risk perception.79,82,83 It is interesting to highlight that studies on breast cancer risk perception have shown that the majority of women underestimate their personal risk to develop breast cancer,83-85 which might exert an important influence on early detection practices and on delayed medical attention for breast symptoms. Finally, we detected very few studies on the role of social networks and social support in breast cancer delay. Table III summarizes factors in relation to provider delay. As can be observed when comparing between Tables II and III, this type of delay has been a lot less studied than patient delay. We believe this is a reflection of two trends: 1) the minimization of socio-medical and health services research that competes with the overwhelming advances in biomedical knowledge and technology and 2) the fact that the medical model has traditionally attributed health problems and lack of their medical attention to the affected individuals, thus blaming the "victim,"86 which causes social problems to be reduced to individual behaviors without consideration of the influence exerted by the socio-structural factors and inequity that lead to a differential distribution of disease, access to health services and quality of care. Among the most studied factors in relation to pro vider delay we again find characteristics of the patient: young age5,7,32,54, 87 and having breast symptoms other than a tumor,54,87,88 both of which make the physician's diagnosis more difficult; having African or Hispanic ethnicity in countries where the majority of the population is Caucasian14,17,54,57,89 and low socioeconomic status.5,57,87,90 While there seems to be consensus regarding young age and presenting symptoms different from a breast lump, the relation of provider delay with ethnicity and SES is still controversial. They have both been deficiently measured in order to understand how they intervene with timely medical attention through availability, accessibility and acceptability of health services. Nevertheless, the way these variables have been conceptualized allocate delay responsibility on the patient as an individual instead of dealing with the much more complex problem of understanding the ways in which health systems are inequitable with minorities and with the poor. Knowledge of factors associated with breast cancer delay that have been studied helps to understand how the study of delay has been constructed. Nevertheless, research strategies and methods also constitute a determinant factor in the advance of scientific knowledge. It is therefore also necessary to explore the methodological evolution of research studies on delay to more comprehensively understand past achievements and constraints to be overcome in future research. Table IV presents general characteristics of studies that analyzed the factors listed in Tables II and III. As it can be observed, the majority of studies use quantitative methods which aren't very helpful for a deep understanding of the underlying reasons why women delay seeking medical attention and the health services obstacles they are confronted with. 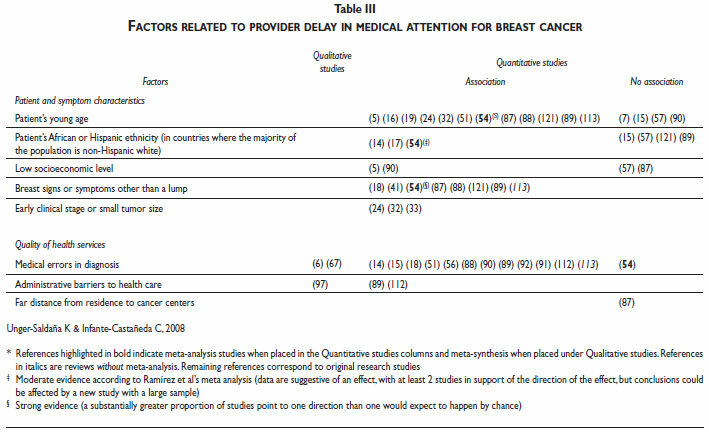 Among quantitative studies, the following issues called our attention: 1) There is an evident lack of popula tion based studies which accounts for the lack of information on women with breast cancer that never reach health services for medical attention; 2) Since a prospective study on delay is unethical, all studies are retrospective, which implies certain limitations. The most mentioned limitation throughout studies on delay is recall bias, i.e. women might report wrong dates and delay time because they don't remember well. Nonetheless, it has been shown that usually women do recall quite well the beginning of their symptoms.41,94 Another limitation of retrospective studies is that patients may report less delay than they really experimented in an effort to please the interviewer with "an adequate answer"; 3)Some studies used self-administered questionnaires which have the disadvantage of lower participation rates, specially if it is a postal questionnaire,95 and the threat of selection bias. People who participate in this type of survey are usually more interested in their own health, fact that is probably linked with timely medical care seeking, in comparison to people that do not bother to answer the questionnaire; 4)The use of clinical records and population registries has the limitation of the quality of information and that only the available data can be used. 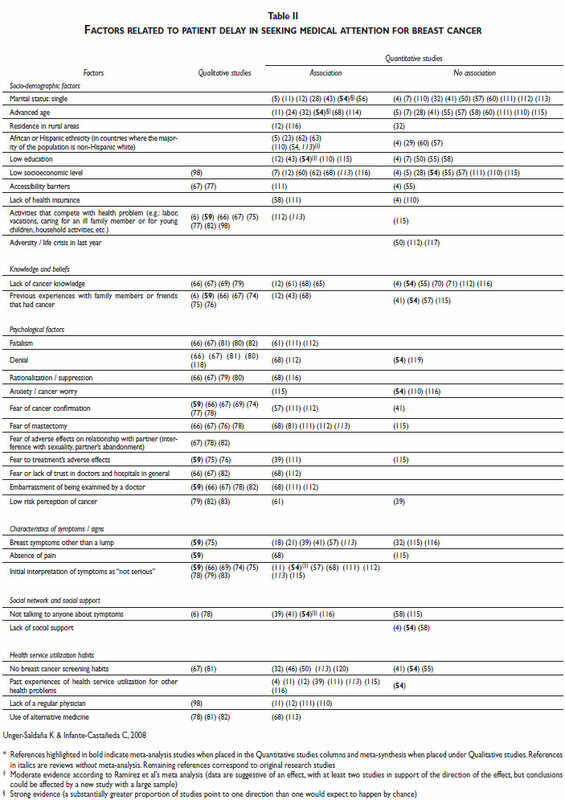 Furthermore, delay has been shown to be underestimated when calculated based on information obtained from medical records;94 5)The lack of validation of instruments that measure delay is a problem common to most studies; and 6)Operational definitions used differ tremendously (Table IV) and this impedes comparison of results and meta-analysis that allow for more valid conclusions about the relationship between different factors and delay. Even though in Mexico about 50% of breast cancer patients are diagnosed at stages III and IV,99 research on the reasons behind delayed medical attention of breast cancer is practically non-existent. Only one published study done in Mexico was found,55 with several methodological limitations. It was done in Mexico City, in a military health services clinic that offers specialized services for women. It included only 40 patients, among which there was patient delay in 14 (35%) and provider delay greater than three months in 21 (52.5%). This study reports the association of certain factors with clinical stage, which was considered as the dependent variable that reflected delay. It was interesting that they considered indicators of accessibility but the small sample size did not allow for significant findings. In Mexico, treatment expenditures for many previously uninsured women with breast cancer have been covered since 2007108 thanks to the creation of the program "Seguro Popular de Salud" (Popular Health Insurance). This is a program that subsidizes an explicit system of health interventions financed with contributions by federal and state governments and by affiliated families.109 While recognizing this as a very relevant effort to overcome treatment coverage problems that existed for this population, there are still multiple barriers that impede breast cancer patients to be timely diagnosed and treated. Identification of factors related to delay of diagnosis and treatment in the context of underdeveloped countries, including Mexico, is greatly needed. Only five of the breast cancer delay studies reviewed were done in developing countries: Thailand, Iran, Colombia and Mexico. The study of breast cancer delay considering specific socio-cultural and health systems characteristics would allow for the identification of specific factors toward which interventions should be directed. Many of these factors are difficult to modify since they are cultural or at the society's structural level; the challenge we face is finding modifiable mechanisms that can improve early medical attention of breast cancer in each country. This paper identifies knowledge gaps and methodological inconsistencies found in international publications of breast cancer delay. Our purpose was to facilitate the identification of the most pressing research needs on the matter. There is a need for more comprehensive research that takes into account socio-structural and health services factors. Furthermore, research on delay should aim to identify locally modifiable factors in underdeveloped countries towards which equity oriented political programs can be directed to improve medical attention for breast cancer so that mortality rates can be reduced and patients' quality of life improved. This study was supported by a grant from CONACYT/SSA/IMSS/ISSSTE SALUD-2007-C01-69439. We thank Franz G. Pruefer for critically reviewing the paper. 5. Neal RD, Allgar VL. Sociodemographic factors and delays in the diagnosis of six cancers: analysis of data from the "National Survey of NHS Patients: Cancer". Br J Cancer 2005;92(11):1971-5. 40. GIVIO (Interdisciplinary Group for Cancer Care Evaluation) Italy. Reducing diagnostic delay in breast cancer. Possible therapeutic implications. . Cancer 1986;58(8):1756-61. 64. Lynch J, Kaplan G. Socioeconomic Position. In: Berkman LF, Kawachi I, editors. Social Epidemiology. New York: Oxford University Press; 2000. 100. Unger-Saldaña K, Infante-Castañeda C. Delayed Medical Attention of Breast Cancer in Mexican Women [Congress Abstract]. In: International Union Against Cancer UICC 2008 World Cancer Congress "Towards true cancer control". Geneva, Switzerland: UICC; 2008. 103. Anderson BO, Shyyan R, Eniu A, Smith RA, Yip CH, Bese NS, et al. Breast cancer in limited-resource countries: an overview of the Breast Health Global Initiative 2005 guidelines. Breast J 2006;12 Suppl 1:S3-15. 107. Smith RA, Caleffi M, Albert US, Chen TH, Duffy SW, Franceschi D, et al. Breast cancer in limited-resource countries: early detection and access to care. Breast J 2006;12 Suppl 1:S16-26. 109. Frenk J, Gonzalez-Pier E, Gomez-Dantes O, Lezana MA, Knaul FM. [Comprehensive reform to improve health system performance in Mexico]. Salud Publica Mex 2007;49 Suppl 1:S23-36.